ISLAMABAD: The Public Accounts Committee sought details of the status of 168 pending cases from the National Accountability Bureau which was sent to the bureau by the committee in the last 10 years by Tuesday. In the first formal meeting of the Public Accounts Committee, its Chairman Shahbaz Sharif also announced that he will not chair the meeting when the audit paras of the PML-N government would be discussed in the committee while proposing four to five sub-committees of the PAC to examine the audit paras of the PML-N's tenure. PAC Chairman Shahbaz Sharif also announced that he will not be part of any committee which examines the audit of the PML-N government. Besides seeking the report of pending cases referred to NAB by the PAC in the last decade, the PAC chairman has also sought a briefing by the department of the Auditor General of Pakistan on pending 18,000 audit paras on Monday. Shahbaz Sharif’s production orders were issued by Deputy Speaker National Assembly Qasim Khan Suri on Thursday for the PAC meeting that will continue till Tuesday. On the start of the first formal meeting of the PAC, PAC Chairman Shahbaz Sharif said it was a honour for all of us for being a member of the PAC as though all the standing committees of the National Assembly have importance yet the PAC has a significant role to bring all the departments and institutions under financial discipline. “I am used to teamwork and desire that all of us should work while remaining under the ambit of law,” he said. Shahbaz Sharif said the PAC was not a forum of running news through the media. While briefing the PAC, secretary PAC Wing of the National Assembly told the committee that so far the audit reports of eight years were pending before the committee that comprise 18,043 audit paras. Giving the performance of PAC during the chairmanship of Chaudhry Nisar Ali Khan, he informed the committee that the PAC and its sub-committee held 440 meetings and recovered Rs117.894 billion while PAC headed by Nadeem Afzal Chan held 174 meetings during the tenure, recovered Rs30.903 billion, 33 cases were referred to NAB and 13 to FIA. 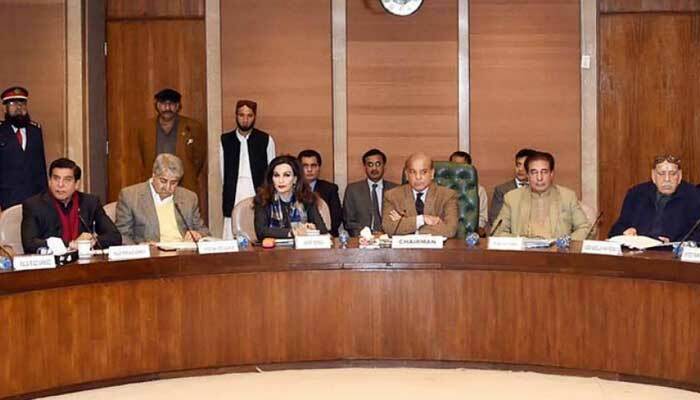 While during the PAC in the chairmanship of Syed Khursheed Shah, the secretary PAC wing of the National Assembly Secretariat informed the committee that the PAC and its sub-committee held 456 meetings, eight reports were presented in the National Assembly, examined seven reports partially, recovered Rs355.6 billion, 168 audit paras were referred to the NAB and 56 audit paras were referred to the FIA. He informed the committee that the PAC, which was headed by Syed Khursheed Shah, took up the issue of excess salary and privilege of the ex-Auditor General of Pakistan and his removal by the Supreme Judicial Council, irregularities/embezzlement in leasing out the land of Grand Hayat Hotel, weak follow-up on cases by the federal ministries, delay in construction of the new Islamabad Airport, irregularities in leasing out the land for Royal Palm Golf Club, losses/theft and burden of circular debt, causes of delay in implementation of PSDP projects and the issue relating to award of work of Naulang Dam project, Balochistan. On the issue of pending 168 cases referred to NAB by the PAC, PML-N member Shaikh Rohail Asghar said these cases were pending since the last decade and no report of their status was yet presented in the committee. Chairman PAC Shahbaz Sharif directed the NAB to give a briefing to the committee with regard to the pending cases in the next meeting of the committee. The representative of NAB told the chairman that he had talked with his DG and was ready to give a briefing to the committee on Monday. PTI member Sardar Nasarullah Dreshak advised Shahbaz Sharif that it was the first session and rather than taking things in a hurry, it would be better to take things normally. Shahbaz Sharif replied, “Yes, you are saying right. I am not in hurry.” He directed the NAB to come with full preparation on the details of the pending cases before them, which were referred to them by the PAC in the last decade, on Tuesday. During the meeting, Leader of House in the Senate Shibli Fraz pointed out the audit irregularities of over Rs5 trillion in the audit report for the financial year 2016-17 of the department of Auditor General of Pakistan. The Auditor General of Pakistan explained that the financial irregularities of over Rs 5 trillion were pointed but it was not alone of the federal ministries and departments but also of charged expenditures, which were not voted in the budget. “There were two components one relates to voted expenditure which comes before the National Assembly for voting which were of around Rs 3 trillion on which National Assembly and the other component is Charged Expenditure which were also laid down in the National Assembly but these were not voted and these are around over Rs 13 trillion that include expenditures of President House, repayments of domestic and foreign loans and other departments,” he said. He said his department will give a briefing to the PAC on Monday. The PAC appreciated the performance of the PAC during the tenure of Chaudhry Nisar Ali Khan and Syed Khursheed Shah.